Does anyone scrapbook the old-fashioned way any more? It used to be such a thing that the noun became a verb. Nowadays, the digital form of scrapbooking is so handy, with the ability to share old photos with virtually anyone worldwide. Throughout our 73-year history, there’s always been someone taking photos. They’re tucked away in file folders, like glorious Easter Eggs waiting to be discovered. 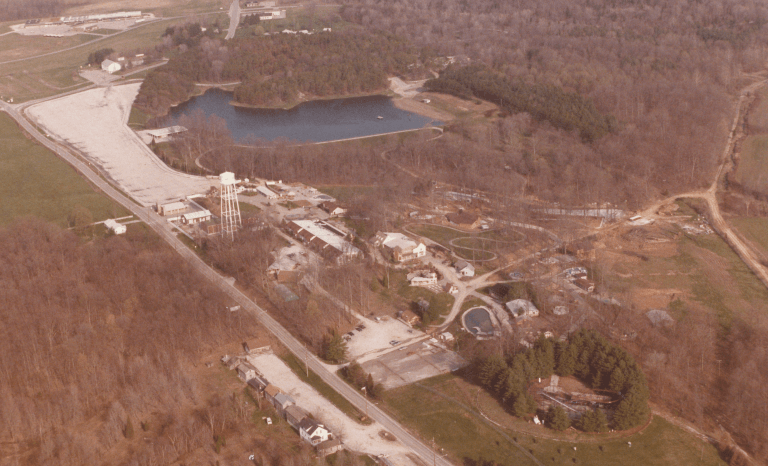 Although there’s no date on the back of this aerial photo, we’re pretty sure it was taken during the winter/spring of 1984. How did we come up with that year? The most telling hint is Frightful Falls. It appears to be under construction (it opened in 1984). It doesn’t look like the lift hill or the station is built yet. Do you enjoy peeking back into our history? If so, here’s a Park Timeline that includes the years that various attractions were added, plus other fun facts about our history. We’ll occasionally dip into the vault and release other archival footage, photos, and articles at #FlashbackFriday posts here. Would you like to receive HoliBlog notices – along with news releases and sweepstakes – by email? Sign up here and you can choose whether to receive the emails weekly or the same day the blog posts are published. Thank you! Thank you for sharing. These are my absolute favorite type of photos. Reminds me of a simpler time. My, how we have grown. Please bring back the “Spider” – Paul Revere’s Midnight Ride!! I have been to Santa Claus Land & Holiday world since I was 4 which was 1977! My family came every summer and we continue to do so with my son. I remember the old Firecracker rollercoaster where holidog world is now. First & last rollercoaster I got to ride with my grandpa. Great memories at Santa Claus Land for sure!!! Best place to go with your family!!! Great photos…..reminds me of jus good family fun for all! A time with less stress and worries….wish there was a time machine at Holiday World lol. The best place I ever took my grandkids!